Residential intensive driving courses allow you to learn to drive very quickly for work commitments, or even just for yourself, and taking a crash course with Academy Intensive Limited can help you learn quickly in a safe and controlled environment. The Academy Intensive approach to teaching has proven time and time again to be effective and significantly less stressful than learning to drive in the big city. Obviously is it far quicker to pass your test by doing one of our crash courses, but there are far more advantages than this. What are the advantages of the Academy Residential Intensive Driving Courses? Compared with hourly lessons you will require far less hours ‘behind the wheel’ as you will save time by not having to do the ‘introduction/recap’ every lesson and there is far less chance of forgetting things which is what tends to happen with a weeks gap between lessons. This is also a great boost for giving confidence to nervous people. Our roads though much quieter than those of a city still offer all the problems of traffic calming, dual-carriage ways and more but without all the stress of busy traffic. The only downside we can see from doing our residential intensive driving courses is that they can be very exhausting, however with the great accommodation we arrange for you and the inclusion of plenty of rest time this should not be a problem. We also offer half and half courses which are very popular for long courses where you can come and do 20 to 25 hours have the weekend off and then return for the other 20 to 25 hours! Please check out our half & half page for more details or email us. We arrange quality accommodation for you during your course. Full details are on our Course Accommodation page. When comparing prices with other schools remember to add in ALL the ‘extras’ like accommodation and test fees to their prices and you will then see our courses are fantastic value! Go to our compare prices page to see just how we compare against hourly lessons and the competition. With over 20 years experience we pride ourselves on the quality of our tuition and accommodation so can book in complete confidence knowing that we have arranged everything for you, just look at our reviews! Kings Lynn is easy to get to by train (we even meet you at the station), just 1.5 hours from London – we regularly train people from London, Birmingham, Manchester, Glasgow, and even Inverness! Your success is our success but it will only happen if you book the correct course for your ability! 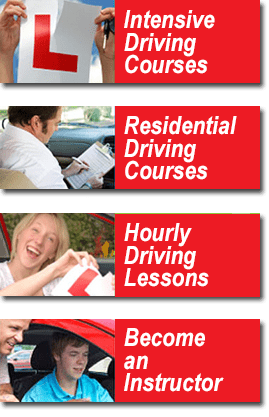 Please take your time to look at our full range of residential intensive driving courses and then choose the right one for the standard that you are already at! Please be very honest with yourself.